Signs by Van has the best custom sign artists in California. The people who work here blur the line between artist and craftsmen every day. Each of our master in-house artisans carve custom signs that will make your business stand out from the rest. We finish each custom wooden sign with the most durable paints and protective sealants to help them last for years on end. Our metal signs are treated to prevent rust and are sure to stay in tact and look great as long as they’re on display. All of our custom business signage is completely made in-house at our Salinas location by our highly experienced artisans, sparing no detail to make your sign come to life. Our portfolio is filled with unique carvings for businesses and occasions all across California. These signs create unmatched visual interest that’s unachievable by any other sign making form. 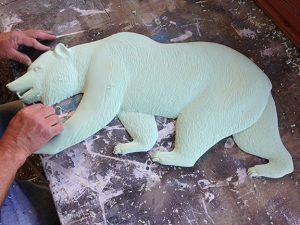 At Signs by Van in Monterey County, we use a bas relief carving method that allows us to create full three-dimensional art. A great example of bas relief art are the images on U.S. coins, such as the state and territory quarters that come out each year. Only the expert artists at Signs by Van can help achieve this level of imagery for your business, location, or occasion. We can make just about any kind of custom sign, from restaurant signage to custom winery signs. At Signs by Van, we guarantee to make and deliver a custom business sign that will impress both you and your customers. Order your custom wood signs or custom iron work today!